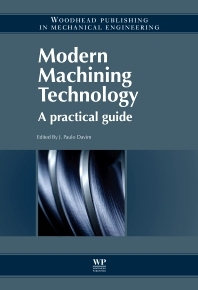 This forward-thinking, practical book provides essential information on modern machining technology for industry with emphasis on the processes used regularly across several major industries. Machining technology presents great interest for many important industries including automotive, aeronautics, aerospace, renewable energy, moulds and dies, biomedical, and many others. Machining processes are manufacturing processes in which parts are shaped by the removal of unwanted material; these processes cover several stages and are usually divided into the following categories: cutting (involving single point or multipoint cutting tools); abrasive processes (including grinding and advanced machining processes, such as EDM (electrical discharge machining), LBM (laser-beam machining), AWJM (abrasive water jet machining) and USM (ultrasonic machining). Manufacturing researchers, mechanical, manufacturing and industrial engineers, and professionals in related industries with machine-tools and manufacture experience. Also students and academics, possibly as a text.